Be the first to share your favorite memory, photo or story of Alexander. This memorial page is dedicated for family, friends and future generations to celebrate the life of their loved one. Alexander Koulion “Boo-Boo” Patterson, 49, transitioned from life on March 24, 2019. He was born on August 26, 1969 in Danville, Virginia to Alexander Roosevelt and Lorraine H. Patterson. Alexander graduated from Laurel Park High School in 1987 and was a member of Jerusalem Christian Church. He attended Patrick Henry Community College before working at Tultex and Nautica. Alexander was preceded in death by his father, Alexander Roosevelt Patterson. Among survivors are his mother, Lorraine Hairston Patterson; brother, Ronald Keith Patterson; daughter Tierra Tachell Patterson, of Martinsville; son, Alexander Shaquille Patterson of Amherst, Virginia; stepson Ta’Kobe Hairston of Martinsville; and grandchildren, Alex Redd, Aniya Patterson, and Tiffany Patterson of Martinsville. Additional relatives include uncles, Gerald Patterson, Bernard Patterson, Ronnie Patterson of Danville, Virginia, Rev. Joe Robert (Evelyn) Hairston of Reynolds Georgia; aunts, Deborah Patterson, Loretta Patterson, Patsy Patterson of Danville, Virginia; along with a cousin whom he was raised with C.R. “Chucky” Ellis of Perth Western Australia; and Special Friend, Ms. Patricia Ann Jones of Martinsville. 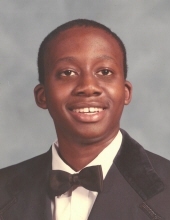 Among other earthly pursuits, Alexander enjoyed sports and he was an avid Pittsburgh Steeler, North Carolina Tarheel, Pittsburgh Pirate, and Chicago Bulls fan. He had coached several seasons in the Henry County Parks and Recreation basketball competition. He also liked bowling, movies, and spending time with friends and family. A memorial service will be held at 2 p.m. on Thursday, March 28, 2019 at Norris Funeral Services, Martinsville Chapel with Rev. Joe Robert Hairston, Jr. and Pastor Robert Smith officiating. Visitation will be one hour prior to the service from 1 p.m. to 2 p.m. at Norris Funeral Services. Burial will be private. Norris Funeral Services, Inc. and Crematory, Martinsville, VA is serving the Patterson family. To send flowers or a remembrance gift to the family of Alexander Koulion Patterson, please visit our Tribute Store. "Email Address" would like to share the life celebration of Alexander Koulion Patterson. Click on the "link" to go to share a favorite memory or leave a condolence message for the family.